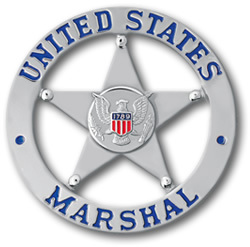 Newly introduced legislation would authorize the United States Mint to produce gold, silver and clad commemorative coins honoring the 225th anniversary of the establishment of the US Marshals Service. The United States Marshals Service 225th Anniversary Commemorative Coin Act calls for a maximum of 100,000 $5 gold coins, 500,000 silver dollars and 750,000 clad half dollars to be minted and issued for the public in calendar year 2015. A limited number of the commemorative coins may be issued to Marshals Service employees in 2014 which is the actual year for the 225th anniversary celebration. The gold, silver and clad coins would be struck in numismatic proof and uncirculated qualities. The Act, brought forward in the House as H.R. 886 and in the Senate as S. 431, is not the first attempt at celebrating the anniversary. Bills were introduced in 2009 and 2010 (H.R. 2799 and H.R. 5680) by then Rep. John Boozman of Arkansas seeking US Marshals commemorative coins in silver and gold. But those pieces of legislation died with inaction and the end of the last session of Congress. the absence of an edge inclusion or edge letterings stating the US Marshals Service motto of "Justice, Integrity, Service"
The $5 commemorative coin would weigh 8.359 grams, have a diameter of 0.850 inches and contain 90 percent gold and 10 percent alloy. The commemorative silver dollar would weigh 27.73 grams, have a diameter of 1.500 inches and have a composition of 90 percent silver and 10 percent alloy. The clad half dollar would weigh 11.34 grams, have a diameter of 1.205 inches and feature a composition of 8.33 percent nickel with the remaining balance in copper. The obverse or heads side design for the commemorative $5 gold and silver dollar would feature an image of the United States Marshals Service Star (also known as "America’s Star"). The clad half dollar obverse would "bear an image emblematic of the United States Marshals Service and its history." Common design requirements for each coin are the mint date of "2015," the years "1789" and "2014," denoting US Marshals Service 225th anniversary, and the words "Liberty," "In God We Trust," "United States of America," and "E Pluribus Unum." The two news bills were introduced on March 2, 2011, by members of Arkansas’ Congressional Delegation. Surcharges for each coin sold by the United States Mint would be forwarded to U.S. Marshals Museum (located in Arkansas), The National Center for Missing & Exploited Children, National Law Enforcement Officers Memorial Fund, and the Federal Law Enforcement Officers Association Foundation. The Senate version, S. 431, was proposed by Sen. Mark Pryor and is cosponsored by Boozman who introduced the previous two pieces of legislation. "The U.S. Marshals Service inspires others to live with justice, integrity and service," Pryor said. “This commemorative coin and the museum in Fort Smith will honor the role and commitment of our U.S. Marshals Service." "The commemorative coin recognizes the influential work the men and women of the U.S. Marshals Service do for this nation," Boozman said. "This allows us the opportunity to highlight Arkansas’s role in the development and growth of our nation." H.R. 866 was brought forward by Rep. Steve Womack and has 10 cosponsors, including Rick Crawford, Tim Griffin and Mike Ross of Arkansas. "It is truly a privilege to introduce this legislation celebrating the 225th anniversary of the U.S. Marshals Service," said Womack. "Not only will this commemorative coin be a constant reminder and symbol of justice, integrity and service, but the proceeds will help bring to life this great history for generations to come." For the any version of the United States Marshals Service 225th Anniversary Commemorative Coin Act to become law, it must pass in the House, the Senate and get signed by the President. H.R. 886 and S. 431 currently reside in committees.